Find decorative vent covers in a thicker 7/8 inch faceplate depth to match your baseboard trim. 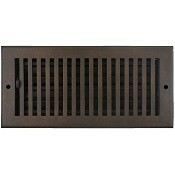 These baseboard Shoemaker grilles are made of all steel and feature a classic slotted design on the faceplate. The fins or openings on the baseboard returns are angled and space 1/2 inch apart. Choose from seven attractive finish choices, which make these decorative vent covers superior to standard white or brown baseboard covers. All shoemaker grilles come with matching installation screws for a seamless look. Tip: Do not measure your old/existing baseboard returns, measure the size of the wall opening to determine the size of baseboard return. Shoemaker baseboard grille sizes listed are for the hole size they fit, total outside measurements can be found in the table above. Find other rectangular baseboard return options available on our site. 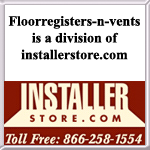 Decorative vent covers in these Shoemaker designer colors are also offered in a rectangular baseboard register and a triangular baseboard register. 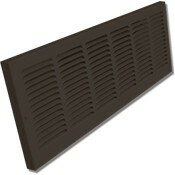 Replace your existing damaged basebaord returns with these affordable decorative vent covers today!